Starting in June, Protective Services will start using a new training program to better equip officers dealing with mental health-related issues on campus. "It's not unusual for police officers to do scenario-type training," said Harold Shiffman, the operations manager at Protective Services. Typically, this is use-of-force training, where the end goal is to reduce tensions and diffuse situations peacefully. The training was developed by Yasmeen Krameddine and Peter Silverstone, two researchers from the University of Alberta's Department of Psychiatry. Their research-based approach emphasizes the interaction between officers and those who have a potential mental illness— focusing on improving empathy, communication skills and the ability of officers to de-escalate those tense situations. With Edmonton police officers serving as the guinea pigs for the training program, actors were brought in to enact specific scenarios involving mental duress, ranging from hallucinations to depressive behaviour to potential domestic conflict. Feedback would follow each session, where the actors and officers could debrief the situation and identify other approaches to the situation. The day-long scenario training had an impressive rate of success: officers were able to verbally de-escalate more situations and the use of force for mental health calls reduced annually for three years in a row. Officers also reported feeling more empathetic and better equipped to communicate with the public. 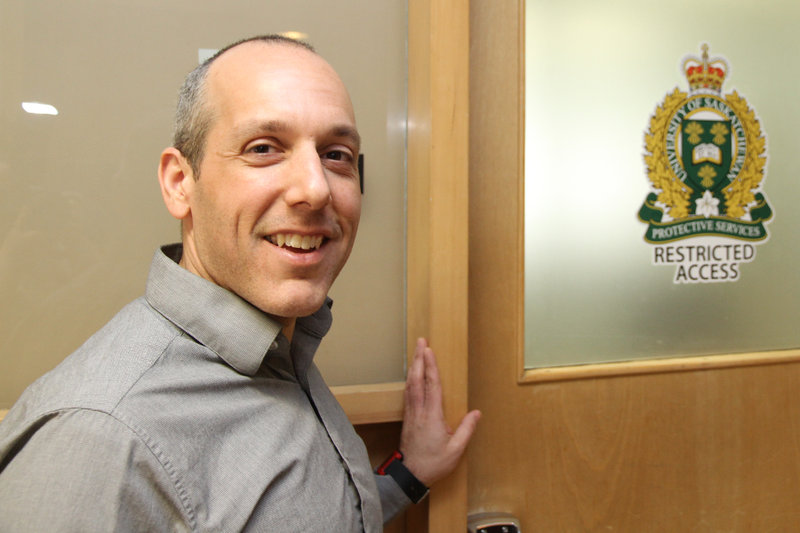 The current training regimen used by Protective Services, called Mental Health First Aid, is primarily-book-based and is standardized for police forces throughout the province, said Shiffman. One of his colleagues brought the new research to his attention a few years ago, and "we immediately became interested in it." However, the price tag— which included travel to and from Edmonton as well as the training sessions—was insurmountable. Once Krameddine and Silverstone completed their research, though, they commercialized their product into a training program called ProTraining, available to security forces and agencies. The U of S is the first such agency outside of Alberta to participate in ProTraining, said Shiffman. To facilitate this type of training, Protective Services partnered with the Clinical Learning Resources Centre (CLRC), located in the Health Sciences Building. The CLRC has a pool of 200 actors, used as standardized patients for health science students to practice their clinical skills on, who will also play the roles for the officer training. "Instead of having a stomach ulcer, they may have some sort of mental illness," explained Shiffman, adding that the benefits of such a partnership extend far beyond Protective Services and the CLRC. "There may be a lot of other ways that we can utilize this on campus because we're not unique in having to deal with people suffering from mental illness," he said. "Our officers will go through those scenarios, and the facilitators will evaluate how those interactions went and give them feedback on how they may improve." With instances of mental illnesses increasing globally, Shiffman added that the time is right to enable officers with this caliber of training. "We're finding that we're dealing with people suffering from mental illness more and more these days."